SCD Group: What business is your association in? The newspaper industry thought they were in the paper, ink and printing business. But, they were wrong. They are really in the information and content business. And, most newspapers missed out on the dramatic change in how that content is delivered. Not unlike the old saying that railroads forgot they were in the transportation business. The relentless pursuit of non-dues revenue over the last 20+ years has distracted many associations from their core purpose. And, this in turn, distracts members from the core reason why the association exists in the first place. Are we in the insurance business? The car rental business? The discount paper business? I don’t think so. But what are our members hearing as our associations “promote” sales of all types of nondues revenue items? Several years ago, I managed a national association which – for good reasons – offered liability insurance to its members. It was a policy most could not get anywhere else. Everything was great until the insurance market changed and the association could no longer find a carrier to provide the liability package. Once members learned they could not get their discounted insurance, they dropped their membership ... big time ... resulted in about a 30 percent drop in the association’s membership. This situation makes me wonder: where is the perceived value of belonging to your professional association? Do we really want members who join only to get insurance or discounts? Most people don’t join to get rental car discounts or the other “toys” associations provide in the name of association benefits and the goal of nondues revenue. Perhaps it is time for associations to return to their core. Why do we have an association? What is our cause, purpose or mission? And, is that purpose relevant today? Content (information, education, conferences, etc.) that help those in the industry or profession improve their skills, their company, etc. Advocacy to lobby for legislation/regulation favorable to the industry/profession or to lobby against legislation/regulation unfavorable. Marketing & promotion ... increasing consumer perception of the industry/profession. The key for associations is to create an active community of those who support and live by the association’s core reason to exist. And, that is my challenge to you and your association. Go back to your Why. Make sure what you do relates to why you exist. PS. 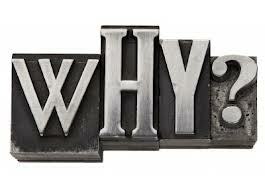 Some of my thinking about this comes from Simon Sinek’s awesome book Start with Why.